Located across from a Senior Citizen's residence that provides "eyes on the street," this garden began in 2011 as a rebuilding of an abandoned lot. 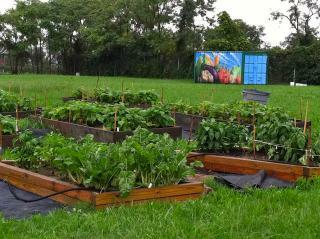 The garden has 18 raised beds, 14 10-food rows, 4 mobility boxes, and one sensory herb garden. To date, this garden has established compost areas, on-site market stands, processing station, Respite Garden, and a tunnel. This garden was transformed under the direction and vision of Juanita Ewell, with help from Nadine Braunstein. Currently, the garden is managed by Juanita Ewell, Pamela Hargest, and Joanna Winkler. Member of Farm Alliance, a network of urban farms dedicated to improving the viability of farming in Baltimore City and increasing access to healthy, city-grown foods.